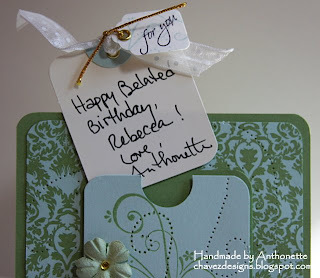 My friend Rebecca's birthday was on Saturday. I didn't remember until Sunday...too late to mail her a card. I hate when that happens. 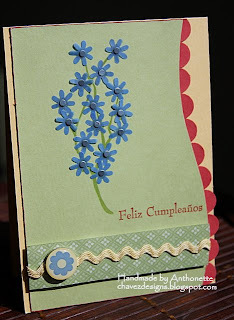 Today I mailed her this belated mini pocket birthday card (hopefully, she won't see my blog before the card arrives). When I saw this Jennifer McGuire Hero Arts video a few months a go, I knew I wanted to try it out. The final size is 4.25 inches x 4.25 inches. 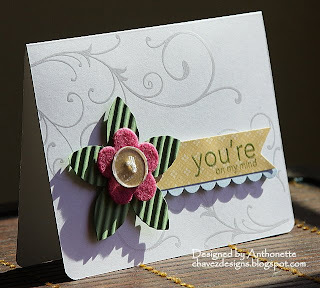 I used the colors from Kristina's last color inspiration challenge and the sketch from Beate's Weekend Sketch #62 to complete this card. I loved this sketch! It's late, so I'll be brief. Thanks for looking. 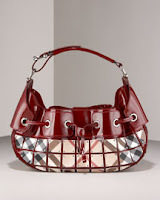 The voting is now open for week 11 of the Designer Handbag Inspiration Challenge on Theresa's blog. 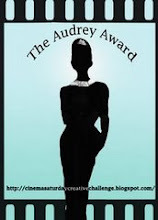 Today and tomorrow (until 7 PM CST on Sunday*) you can vote for my entry on her blog by adding a comment to the following blog entry. Even though there is only 1 more challenge after this one, you should still enter. Theresa has great blog candy each week. It's challenging, but fun! * Thanks to Kristina Werner for pointing out this time conversion website. For readers outside of Theresa's timezone in the USA, select October 19, 2008 and 7:00 PM. Select USA - Minnesota - St. Paul (Theresa's timezone) for the first location. Then, put in your location/time zone and press Convert time. We are down to the home stretch for Theresa's Designer Handbag Inspiration Challenge. This is week 11 of 12. This week's bag is the Kate Spade Oaxaca Reyna Raffia Tote. I barely started this card at 6 PM this evening! 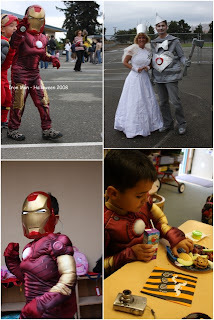 I volunteered at my son's school most of the day. Talk about cutting it close! 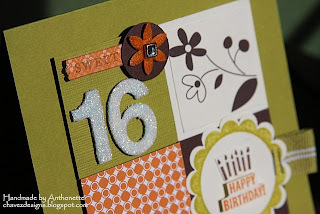 I liked textured cardstock, so I choose to stamp and emboss my images on textured Tangerine Tango. I only had one bird, but I wanted a mirror image. 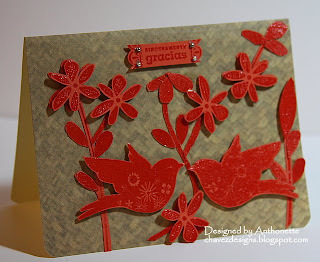 I stamped the bird onto my Pivot Palette and then placed the cardstock on top. I used a brayer to transfer the mirror image to my cardstock. 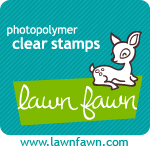 Everything was embossed with clear embossing powder. I also just rubbed VersaMark onto cardstock and embossed a large area. I cut some of the vines out by hand and some of the leaves instead of only using the small leaf stamp in the Vive con Proposito set. 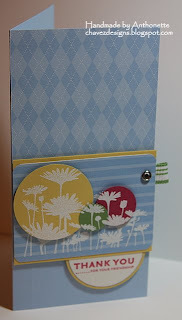 The hardest part of this card was figuring out how to get the woven raffia look. I tried to find digital scrapping sources for this, but I couldn't. I got the bright idea to use the image from the Nordstrom website. They always show the back side of their products. Yes! They had the back of this handbag. I saved the image to my computer and then enlarged it and printed it out on cardstock. I like how it came out. The voting will start tomorrow morning and go through Sunday evening on Theresa's blog. Thanks for looking! Inflammatory Breast Cancer (IBC). When it is diagnosed, it is usually already considered Stage 4 cancer. I bring this to your attention, since unless you have a family member with IBC, you probably never heard of it. It gets easily misdiagnosed, since it can look like a skin irritation. My Aunt was lucky, in my small hometown, the doctor immediately suspected it was IBC and referred her to an oncologist in Santa Fe. According to the Susan G. Komen Foundation "symptoms instead may include redness, swelling, or skin inflammations. Further complicating diagnosis, the disease often cannot be detected via a mammogram or ultrasound, like other breast cancers, and it is very aggressive." My Aunt had both breasts removed almost 2 years ago. She's had more rounds of chemo and radiation than I could count, yet through it all, she's been very positive. She's been able to continue to work. Amazingly, she doesn't get very sick from chemo. For You "Pride & Prejudice"
I've admired Brooke and Sankari's work when I saw it appear in response to Krisina's Color Inspiration challenges. When they started their own challenge a few days ago, I knew I had to jump in. 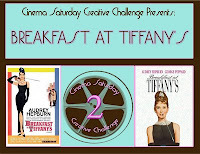 They started the Cinema Saturday Creative Challenge. A long time ago, I noticed on the project ingredients, Sankari would list what movie she watched while creating a particular project. I noticed Brooke doing the same thing. Their first challenge was to create a project inspired by "Pride & Prejudice." I have a computer in my studio, but not a TV. I can watch shows from our TiVo box on my computer because we have a SlingBox...cool device. Sankari gave YouTube links to several "Pride & Prejudice" clips. I was hooked. I read the book in high school and saw the 1995 BBC version of the movie years ago, but I didn't see the Keira Knightly movie. Did you know you can watch the entire 1995 version on YouTube (it's 36 mini files and no commercials)? Since Saturday, I watched the entire series all over again! Girls, you created an addict! I'm almost speaking in a British accent! Colin Firth and Jennifer Ehle are the perfect Mr. Darcy and Elizabeth Bennet. Did you know Jennifer Ehle was born in North Carolina? Anyway on to the card and envelope... 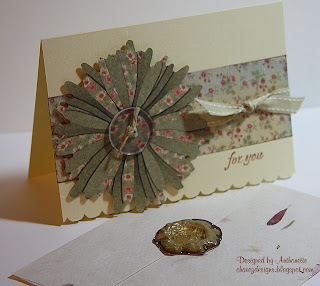 I had some old sealing wax medallions, so I melted one to seal the envelope and pressed a rose stamp onto it. That's the little blob you see. 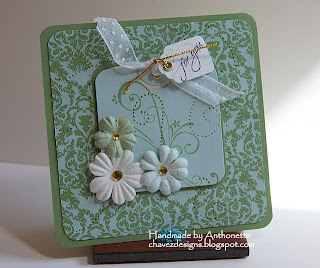 The card was inspired by the muted colors they tended to wear and the vintage floral patterns in their decor. I noticed a lot of creams and a few pops of color. * Thanks to Kristina Werner for pointing out this time conversion website. For readers outside of Theresa's timezone in the USA, select October 12, 2008 and 7:00 PM. Select USA - Minnesota - St. Paul (Theresa's timezone) for the first location. Then, put in your location/time zone and press Convert time. 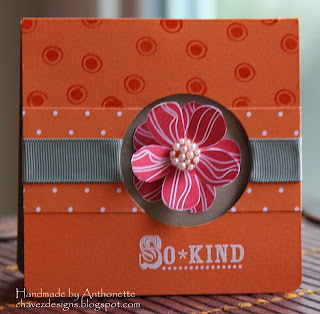 Recently, you'll notice I'm a bit obsessed with making gift card holders. 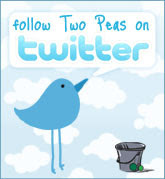 Just in the last 2 weeks, I've posted a few entries: here and here. 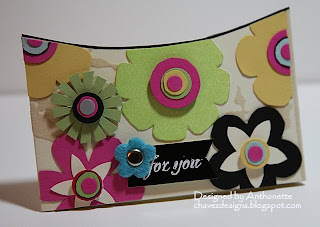 When Theresa posted this Elaine Turner Tote for week 10 of the Designer Handbag Inspiration Challenge, I loved the enormous flowers. I didn't want to do a card this week, but I couldn't decide what I wanted to create. I went to Costco on Wednesday (the same day Theresa posted this challenge). Costco is now selling packs of Starbucks gift cards. 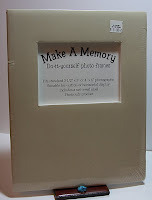 I bought some and loved the nice vanilla cardstock gift card holder they came in. The holder also had some velvety texture on them. I took apart the gift card holder and traced it onto some designer paper...not a good idea. The paper I used was not thick enough for the project. When I was thinking about Theresa's challenge, it came to me that the gift card holder was vanilla colored...just like the inspiration handbag. That's when I realized I wanted to alter the gift card holder. I started by taking a large dinner plate and using it as a template to cut a nice curve off the top. 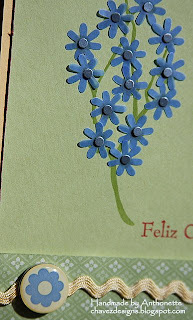 I used the SU Die-cut Blooms as a template to cut flowers in other colors. I used various circle punches and also cut circles by hand to get the effect I wanted. The following collage shows the gift card AFTER and BEFORE I did anything to it. Thanks for looking! Voting starts tomorrow morning on Theresa's blog. Have a good weekend. I miss my best friend, Violet. She moved to the D.C. area a few years ago. Her birthday is next week, so Kristina's Color Inspiration Challenge #25 was a perfect excuse to make Violet's card. 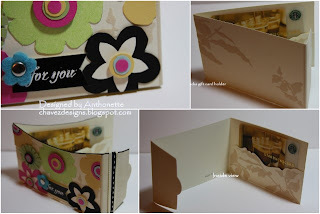 I used part of Kristina's curved template for this card. 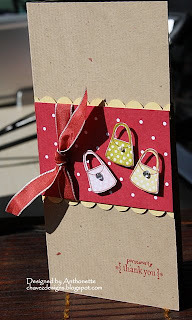 These are more gift card holders I made on Saturday for World Cardmaking Day. Last week, I made these gift card holders. Again I used Kristina's wonderful template and instructions. 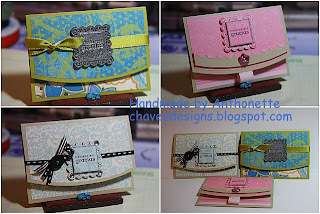 All 3 use the same Thank you stamp from Tarjetas con Bordes Festoneados. 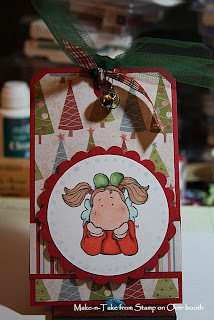 The designer paper used is all scraps from my scrap box. 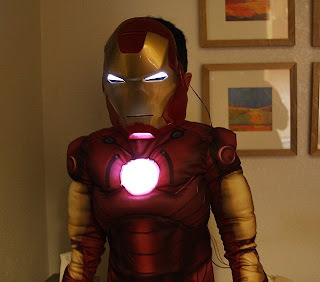 On Saturday morning when I was surfing all your creative blogs, I saw a few of Sherri Barron's blog entries (here, here, and here) with faux metal tags. 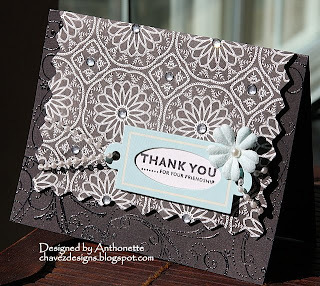 I love everything she makes, so I was immediately inspired to to get out my silver embossing powder. 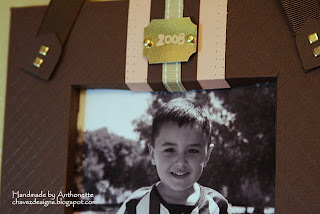 Last month, Adriel from Two Happy Stampers created this cool faux metal tag. I had been wanting to make a tag since I saw Adriel's. This card makes me happy. I made it using Beate's Weekend Sketch #60. I haven't done one of her sketches in a few weeks, but I had to do this one. Last week, I saw this YouTube video by Ku-Ku. This woman is so creative. Check her out! I loved her simple card where she made a spider using a button and googly eyes. She drew in the legs. I knew this spider would be a good addition to the rubbed on spiders. After watching the video, I immediately went downstairs to look for all my black buttons. 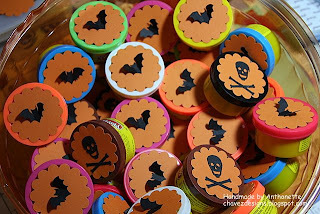 I'm seriously lacking in Halloween stamps. Besides this Happy Halloween stamp, I have none...I know, you're shocked! This card is too thick to mail, but I think I'll give it to my son's Kindergarten teacher. * Thanks to Kristina Werner for pointing out this time conversion website. For readers outside of Theresa's timezone in the USA, select October 5, 2008 and 7:00 PM. Select USA - Minnesota - St. Paul (Theresa's timezone) for the first location. Then, put in your location/time zone and press Convert time. When Theresa posted her latest handbag (a Gwen Stefani L.A.M.B "Music Rocksteady" Tote) for the Designer Handbag Inspiration Challenge #9, I liked the deep mocha color and the texture. 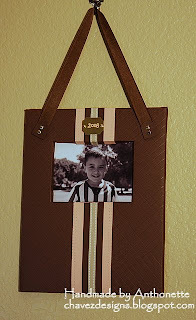 I knew I wanted to create something different this week, so this handbag was a good inspiration for an altered frame. I've had this frame for several years. Each week I keep saying how this challenge is a good reason to dig out and use some very neglected supplies. I picked this photo of Kalino to play-off the vertical strips on his soccer jersey. I started with an 8 1/2" x 11" pieces of Chocolate Chip cardstock. With a bone folder and a ruler, I scored the entire piece of paper is about .5" increments (I wish I had a Scor-Pal). I tried using the scoring blade on my paper cutter, but the cardstock was too large and awkward to use in the cutter with the cardstock turned at 45 degree angles. I cannot believe that the oldest niece on my side of the family is turning 16 in a few days. I had to do the math last night to make sure. Even before Arriana was born, I referred to her as "Little Pookie"...I don't know why. She's in high school now, and I haven't called her Pookie in several years. I made this card for her. Even if I mail it today, it won't arrive in time...I don't like a card to arrive late. 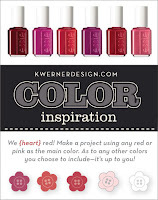 Kristina's color inspiration challenge this week has some nice Fall colors. 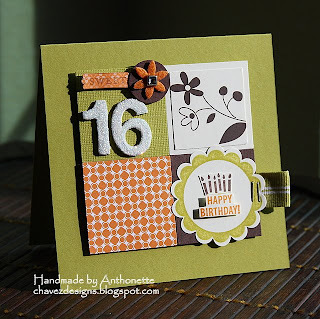 This card's 4-squares layout was inspired by p. 62 of the Fall-Winter 2008 catalog. I knew I wanted to use some rub-ons (I forget to use those). I have a confession to make...I hate working with glitter. I love how it looks on projects, but I always get it everywhere. I inked and embossed the raw chipboard and then decided to add some bling to it. It didn't retain the creamy color it had before. I used the Sweet One stamp in So Many Scallops to stamp "Sweet" on some Pumpkin Pie designer paper with Chocolate Chip ink. It doesn't show up very dark.